Why the Rush to 50? …or more specifically, why the rush to end game? This week, my Inquisitor hit 50. And somehow, she even had enough cash on hand to buy her level 3 speeder riding and speeder! And to clean up a few gear pieces. And thanks to an unusually awesome RNG, she got an epic headpiece out of her first PvP commendation bag. Not bad progress in a game with about 100 hours of playtime that only officially launched on December 20, in the midst of the holidays. It’s sort of hard to believe that I’m at the end of my class story, and now ready to embark upon the many max level activities that lie ahead. I’ve got PvP matches aplenty to do, to farm for the elusive purple lightsaber. I want to do the max level versions of all the flashpoints no one wanted to do during the mad rush to 50. 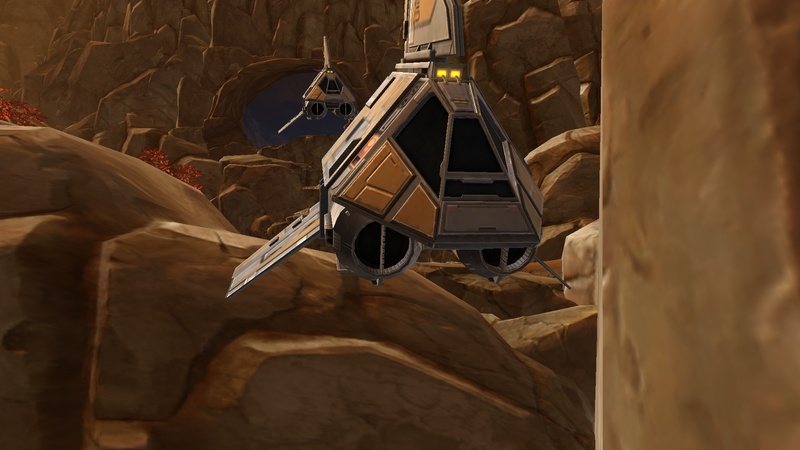 I want to maximize my number of daily quests so I can pick up the daily commendation level 3 speeder. I was poised to take some time and bask in the glow and ease in to end game. I love raiding, as can be attested to by the volume of raiding related posts on the other blog, but I was honestly feeling as though there was plenty for me to do for a week or two or more before jumping in. So while I was excited about a raid this week, it wasn’t on my “it better happen or else” list. I have to tell you I am honestly a little bit floored. I’ve watched my significant other talk to numerous guildies about raiding, including a good amount of pre-50s. He confirmed days and times that seem like they’ll work. Has had strats up on our Wiki for a week or more so everyone can be on the same page. And just this week we finally had enough tanks and healers publicly express interest in raiding that we’re going to give Karraga’s Palace a shot. So, we’ll see how it goes. And you can bet I’ll report back here.